registration when Lost Communication With ECU appears on the Techstream display. this bulletin to properly register TPMS sensors. Note:The software download version provide above is the newest version,if you buy the Mini VCI cable from your dealer,them will sent you lower version tested.You would better to run the version provided by your dealer.The newest version is only for DIY’er try,it haven’t been test on all teachstream hardware. 2.Turn the ignition switch to the “IG-ON” position. 3.Select the datalist for the Tire Pressure Monitoring System. 4.Check and set all tire pressures to specification with an accurate tire pressure gauge and compare the information to what is displayed on the datalist. 6.With the vehicle set to “IG-ON” mode, disconnect the TIS Techstream. 8.Once 30 seconds have passed, with the vehicle still in “IG-ON” mode, remove the jumper wire. 9.Connect TIS Techstream and begin the registration process. 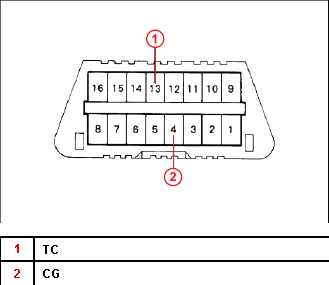 NOTE:If “Lost Communication With ECU” appears during the registration process, then terminals TC and CG were not connected properly or the key was cycled during this process. 10.After registration has been performed, leave TIS Techstream connected and confirm that the tire pressures are reading correctly and the thresold pressures show a difference of 5 to 7psi less than the inflation pressure. For vehicles with a TPMS reset switch, press and hold the reset switch to begin the initialization process. 11.After tire pressures and thresholds pressures display on the datalist, adjust all tire pressures in relation to the expected changes in ambient temperatures.